2018-1208 - Michigan Railroad History Conference. The date for the 2019 History Conference has been selected. It will take place on Saturday, September 21, 2019 at Washtenaw Community College in Ann Arbor. Click here for information. 2018-1130 - Mine information. Individual pages for Iron and Copper mines have been moved to the Stations | Locations sections. Details (type of ore, mining method, railroad and dock service, ownership, etc. have been added from information received from the summary provided by the Lake Superior Iron Ore assocation (1950). To view the mines, go to the Station list, select the county, and the mining menu's are at the bottom of the page. 2018-1116. The upper peninsula mines have been removed from the individual coiunty station lists, and added to their own list at the bottom. Many additional mines have been identified in all ranges. 2018-0515 - An article about the Ford Rouge Industrial Railroad, and a newspaper account of the E&LS in the upper peninsula. 2018-0409 - Updated Research Section 4 (Serials) and Cross Reference. My thanks to Don Meints for keeping this current. Click Here. 2018-0408 - Added article about the beginning of the Detroit, Bay City & Alpena railroad. 2018-0224 - Bridges. Cleaned up the bridge pages and menu. Added many new significant railroad bridges. 2018-0217 - Link Fixes. Many of the County Maps did not display correctly. These have been fixed. 2018-0105 - Research. The Research Section, which Don Meints maintains, has received its annual update. Also added is a cross reference section. My thanks to Don for keeping this curfrent. 2017-0901 - Maritime. A new "Maritime in Michigan" page has been added to the "More" Menu with links to Marine Traffic Ship Finder and the BoatNerd.com website. 2017-0815 - Historical Markers. The list of railroad related historical markers has been updated with about six additional markers added to the list. Access via the Railroad History menu. 2017-0809 - News Feeds. RSS News Feeds have been added to the bottom of "Today's Railroads" and to the bottom of most railroad webpages. See the latest news articles about the railroad industry. Instructions for Posting Photos on Discussion Boards. Instructions for posting photos on the discussion boards has been added to the Discussion page. Built: Late 1917 at the beginning of Rouge Plant construction. Became: Sold or transfered to Canadian National and other entities in the 1970s-1990's.. The industrial railroad at Ford Motor's Rouge Works was one of the largest, single-site industrial railroads in the United States. The railroad encircled the 2,000 acre Dearborn, Michigan facility and provided siding access to most of the buildings within the Rouge complex. Ford Motor was obsessed with owning all resources necessary for building boats, automobiles and other products produced at the Rouge Works.and those incoming resources were interchanged with Ford's Industrial railroad. Coal, coke, limestone, iron ore, sand, and other things brought in rail. Automobiles and byproducts brought out by rail. Ford's railroad was known for operating clean, well-maintained locomotives and rolling stock and they built their own facilities for maintenance. Steam locomotives (and small electric industrial locomotives) were used for switching, followed by Alco diesel switchers and then EMD switchers. Ultimately, the railroad was split up as the steel mill and other buildings were sold to new owners. Auto loading facilities for the newest F-150 truck plant ended up in CN hands, the eventual owner of Ford's DT&I railroad. The Rouge Plant was named after the Rouge River, which ran through the middle of the land used for the plant. The Rouge River, which is a tributory off the Detroit River, was widened so that lake freighters could bring in resources and military boats (the original product produced at the Rouge for the first world war) could be launched. The widening of the river caused a number of railrroad drawbridges to be replaced (DT&I, NYC, Wabash) and may have resulted in the Ford purchase of the DT&I. The Rouge also had Detroit Street Railways access at Miller Road Gate 4 (Miller and Eagle) on the east side and Gate 12 (Schaffer and I-94) on the west side. Thousands of workers travelled to their jobs at the Rouge by using street railways. For an excellent article on the operation of the Rouge and its railroads, see the Spring/Summer, 2018 edition of Railroad History, a publication of the Railway & Locomotive Historical Society. A NET IXCREASE OF $203,075 OVER THE PREVIOUS YEAR. HARD TO DECIDE ON NUMBER OF MILES OPERATED. The Amount to be Paid by the Companies as Now Assessed. Taxes against railroad companies and depot companies for the year ending December 31 are computed according to the rate established by the provisions of act No, 226. of the session laws of 1897. which is the Merriman law. This act amends the general railroad law. According to the computations made and on file in the office of the auditor-general the railroad and depot companies taxed should pay to the state $945,150.49 as against $742,074 63 for the previous year, showing a net increase of S203.075. The earnings as reported by the companies showed a net increase over 1896 to theo amount of $373.083. The additional revenue to which the state has become entitled from this class of companies, notwithstanding the decreased earnings, is the result of several causes stated below, together with the amount resulting from each. Amount added by reason, of the increased -rates fixed by. the act above referred to, $127,150. Additional revenue by reason of the repeal of the provisions of the act exempting railroads north of the forty-fourth parallel from taxation, $16,086. Additional revenue by reason of the taxation of roads having special charters under under the general law, $31,160. Additional revenue due on account of requiring a more complete report of switching switching charges, rentals of tracks, yards and terminals, $14,327. Additional revenue by reason of a reduction by the department of miles of railroad reported as "actually operated", $14,350. In making the computation of taxes under under the act above mentioned, new difficulties difficulties have been added to those referred to in the annual report of this department for the year ending December 31, 1897. The statute seeks to amend the general railroad law by its title, but does not, in its title, refer to the act under which depot companies are incorporated and have heretofore been taxed. The body of the act. however bv its terms, increases the rate of taxation against depot companies. The department has. however, in its opinion, no discretion which it can exercise' in determining the validity or Invalidity of any act. In the computation of the taxes, the.Commissioner of Railroads is a ministerial officer bound to obey the language of the statute, and hence the department has not decided or attempted to decide whether the law, so far as the same affects depot companies, is valid or invalid. It is maintained, however, by these companies, that the enactment is void because it is in contravention of article 4 of section 20 of the constitution of this state, which provides that no law shall embrace more than one object which shall be expressed in its title. And also as being in contravention of section 23 of article 4 of the constitution. The amount involved in this dispute of the depot companies is $12,175.90 In this, as in all matters of dispute affecting the computation of taxes, all doubts have been resolved in favor of the state. If the act is void in it application to the depot companies the question will naturally arise and be disposed of as to whether it is invalid as a whole. By the provisions of section 3 of act 174 of the publc acts of 1891, all railroads thereafter constructed, built and operated north of the 44 parallel of latitue were made exempted from taxation under certain conditions, for the period of ten years. This law remained unrepealed upon the statute books from that time until the passage of act No. 228 of the session laws of 1897, by which the entire section was repealed and no reference made to roads theretofore having the benefits of the act. The act of 1897 further repealed by all acts or parts of acts in any manner inconsistent with its provisions, thus leaving no law upon the statue books under which the roads before its passage exempt from taxation should continue so. I therefore deemed it my duty to follow the letter of the statute as it present upon the books and to compute the taxes upon these roads hich were formerly exempt and based th computation upon their annual reports in the department, as required by law. A hearing was granted to the interested companies at which all were represented by counsel. It is contended by them that the law of 1891 exempting them from taxation constitutes a contract on the part of the state, entered into by it and for a valuable consideration and that the same cannot legally be released by the state without the consent of the companies. A final decision was not made by me upon the merits upon the ground that my jurisdiction did not extend beyond the computation of the taxes as required by the statute, and that the final decision binding upon the state could only be made by a court of competent jurisdiction. Several suits have been commenced to test the validity of this enactment, a speedy determination of which is very desirable. The amount computed against these companies, and which is said litigation is in dispute, less $16,086.44. By the provisions of section 50 of act 125 of the public acts of 1891, it is provided that in any case any such railroad or railway company may have been in the past paying a tax different from that imposed upon railroads by the general law, such company may continue to pay such tax or a ratable propostion thereof up the the first day of July, 1892, but thereafter every such company shall pay a tax in the matter and in the amount now provided by the general laws relating to railways. It is also provided by act No. 133 of the laws of 1891 that every railway or railroad company organized or existing under any special act or acts of incorporation or special or general acts of consolidation, or which has heretofore been taxed under any special act or acts of the legislature of this state, shall, from and after the 31st day of December 1891, for all purposes of taxation be subject in all respects to the provisios of chapter 75 of the compiled laws of 1871, and the acts amendatory thereof, the same as if such company had organized under the provisions of such chapter. My predecessors in office here have seen fit to ignore thse anactments of the legislature. I have taken a different view of the matter and therefore have, as the statute commands, brought all railroad companies operatig under special charters, under the general tax laws of the state, so far as the cpmputation of taxes against them is concerned. On account of the decision of the Supreme Court of this state, as well as an account of the existence the above laws, I have assessed the taxes against the Lake Shore & Michigan Southern Railway company and the Detroit Grand Haven & Milwaukee Railroad company claims, as I understand it, to be exempt from the provisions of the last amendment of the railroad tax law. In the contest which may result from the application of these laws to companies having special privileges under special charters, the rights of the state and their rights should be clearly defined by the courts, and the much-promoted question definately settled. So far as the state's power to tax these companies is concerrned and the extent of its power there should be no uncertainty. The department has made a careful investigation and revision of the reports of the companies relative to the number of miles of railroad which were entitled to enter into and affect the amount of taxes paid by the respective companies. The statute provides that these companies shall pay a tax upon the gross income of road quote actually operated within this state. The only guide in determining whether or not certain railroad mileage should enter into the question of taxation is found in the words "actually operated". In a broad sense of the term all sidetracks and spurs over which cars are run at stated or even at irregular periods might be construed to mean actually operated, and especially would this be true if they were operated to the extent of accommodating the public to the extent of the demands made upon the company. So a case in double track railroads where both tracks are operated, and hence both tracks might be used to reduce the earnings per mile of the road, and as a consequence, be used to reduce the taxes paid by the company by reducing the rate applied to the earnings in the computation. There is so much uncertainty surrounding this element affecting the computation that I deemed it wise, so far as possible, to follow the precedent established by the department, and hence such mileage has only been permitted to enter into the question as consists of main track mileage, upon which there is a service to the public generally, at regular and stated periods, or a continuous service for specific purpose. Many spurs and branches, which at one time were regularly operated by existing companies, have now become dead spurs and branches and have ceased to be operated in the regular course of business, while on some of them irregular service is still rendered, mostly at the special request of some shipper living along the branch or spur. Regular trains are not operated, but in lieu there are off switch engines are sent from center points to draw cars into and out of the spurs and branches., There has been a considerable reduction in Michigan railroad mileage so far as mileage actually operated is concerned, and to the amount of 367.58 miles. Another question of great uncertainty presented under the statute arose out of the leases and trackage rights which certain companies have obtained over the lines of others. For example, the Detroit, Grand Rapids and Western Railroad company has a trackage right from Grand Rapids to Sparta, a distance of 20 miles the Chicago and West Michigan railroad company reports this 20 miles as part of its actual operated railroad, and the Detroit, Grand Rapids and Western reports the same 20 miles is a part of its actually operated railroad, each company using the same mileage to reduce its earnings per mile of road. This method carried to a final conclusion would give the state an immense railroad mileage, but a very small amount of taxes; the greater the mileage resulting from track rights, the less the taxes. In applying the term "actually operated" to this class of mileage I have decided that the company owning the stations, charged with the duty of keeping the tracks, grounds and stations in repair, supplying the station agent and providing the system of train dispatching, was actually operating in the railroad, and is entitled to use the mileage in the tax computation, and that any other company operating in occasional train thereover, less than all the trains operated upon said mileage and was not charged with any specific duty towards keeping the tracks and stations in repair, towards providing station agents and the train dispatching service, was not entitled to use the mileage in the tax computation. There are many instances of this double use of mileage in this state, notablhy the trackage operated by the depot companies in the city of Detroit. The law should not be left uncertain upon this point, and a decision of the courts should be obtained if that will solve the difficulty, or the law should be amended, if the present system of taxation is to continue. Heretofore, railway companies of this state have been instructed to report only balances earned from switching and rents of tracks, yards and terminals. The annual reports followed the form of the interstate commerce blanks in this respect. The interstate commerce commission, however, desire this information only for statistical purposes while in Michigan it should have been, and now is required, for the purpose of living taxed upon the amounts reported. The balance is reported by the company's consisted of the amount or amounts outstanding to the credit of the company after deducting the amount earned from these sources the amount paid out and reporting this balance in the earning. If there was no balance in favor of the company making a report, then no taxes on account of any revenue derived from these sources. Additional information was required by the department upon the subject and furnished by the companies in many instances, under protest. This information consisted of a report of the gross amount earned from their sources by the company, independent of the amount paid out to the other companies for switching or for the use of the tracks, yards, and terminals of the other companies. The amount so reported have been added to the gross income of the company reporting the same and have been taxed under the law. The gross amount reported as earned from these sources by the companies is $228,256.72. Railroad fans have increased with the decline of steam railroading. As the coal burners disappeared many men realized that they had never lost their little boy desire to become a railroad engineer. Their yen for trains became a hobby interest and their special delight is the little railroad. There isn't a happier hunting ground for such train fans than the Upper Peninsula of Michigan. Train hunting isn't as good here as it used to be, but it's still retty good and the railroad historian and hobbyist can have a wonderful time tracing the old grades that spiderweb so much of the Upper Peninsula and remind us of an era to which branch rail lines were in a constant state of extension and retrraction as they reached about to harvest the forests and pulled back their rails when the cutting was finished. The early era of Upper Peninsula logging harvested the pine and moved it to the mills in river drives. By 1912 the hardwood cut was larger than the pine cut in Michigan and many logging railroads were operated by mill companies. Common carrier roads also served the needs of the mills and the mines and the traveling public. The Peninsula still is served by the North Western, the Milwaukee Road, the Soo Line, the Duluth, South Shore & Atlantic, the Copper Range, the Lake Superior & Ishpeming, the Manistique & Lake Superior ("Hay Wire") and the Escanaba & Lake Superior. The Calumet & Hecla Company operates a road for its own mining needs, and the Inland Lime & Stone Co. and U.S. Steel Corp operate short lines from their limestone quarries to lake docks. But many are gone, including the Nahma Northern of the Bay De Noquet Lumber Co, has taken up its tracks; the Wisconsin Michigan (Wish I Missed It), Grand Marais & Seney, the Ontonagon Railroad, the Garden Bay Railroad, the Blaney & Southern, the Indiantown & Southern, the Ingalls, White Rapids & Northern (narrow gauge), the Keweenaw Central and others. The Escanaba & Lake Superior is a game of a line for rail hobbyists. It's small enough so that anyone can learn it intimately - it's relatively easy to walk its main line of 63.5 miles from Wells to Channing - and it's office is a happy family type of organization with big, genial Emil Christensen as general manager. And as a bonus there are the E&LS's nicknames, the management-sponsored Efficiency & Lasting Service, and the much more familiar Easy, Lazy & Slow, the Hook and Eye and the Eggs and Liver Sausage. Christensen started railroading in 1905. The son of a Danish immigrant who became section foreman for the North Western at Marinette, he got a job as a telegrapher with the Wisconsin Michigan, which ran from Menominee to Iron Mountain and down to Peshtigo Point to put ore cars aboard barges for towing to South Chicago. He learrned telegraphy and the next year went to the Noeth Western as a telegrapher on the Peninsula Division, working most of its stations except home base at Menominee and Marinette. Christensen left the North Western Feb. 1, 1909 to go to the E&LS. "In a couple of weeks it'll be 47 years," said Christensen. Then as now the E&LS had nicknames. It is often referred to as the Easy, Lazy & Slow and the Hook And Eye, and sometimes as the Eggs & Liver Sausage. Such names seem more apt to stick to railroads than the Efficiency & Lasting Service. Christensen was a telegrapher for the E&LS for 22 months, then became train dispatcher. In 1937 he was named chief train dispatcher and car accountant and in 1950 was named general manager. The E&LS was organized in 1897 to haul timber from the valley of the Escanaba River to the I. Stephenson Co. mills on Little Baiy de Noc. When Christensen was a young station agent at Kates it was common place for the line to haul 100 to 110 million feet of logs in a winter. Most of the timber went to the I. Stephenson Co. at Wells. The line ran as far west as Watson until 1900, when it was extended to Channing to connect with the Milwaukee Road and give the I. Stephenson Co. a competitive rail connection with the North Western. The road created many branches to harvest timber, including the Mashek, Ralph, Turner, Hendricks and Northland branches. The line operated then as it does now in Delta, Marquette and Dickinson counties. At one time it had a branch to within five miles of Gwinn. The names of its stations reflect the connections of its executives. The late John W. Wells, manager of the I. Stephenson Co. for many years, named Alfred and Ralph for his sons, Grant and Watson were named for Grand and I. Watson Stephenson, Kates was named for C. W. Kates, the general manager of the line who had a private care like a mobile hotel. 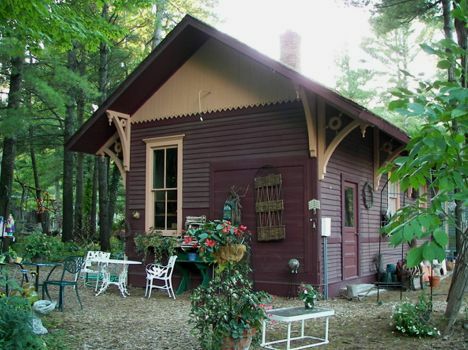 The railroad was a force in the settlement and development of the Escanaba River Valley. Its passenger business was an important part of its operations at one time and it was not unusual for its trains to have 200 passengers aboard. Now the line has but one coach and it wishes that the Interstate Commerce Commission would let it abandon that one and shuck its passenter haul. Passengers have long since shucked the E&LS; its 1954 income from passengers was only $25 for the entire year of 1954 and it came almost entirely from one passenger, H. S. Kaliman of Woodlawn. But when the E&LS petitioned the ICC to abandon its passenger service about 1945 a public hearing brought out about 300 persons who protested abandonment of the service. When the highway conditions are bad the line may still get a little spurt of business but it's small and brief. When the E&LS started operating there was no highway parelleling it, now the highways have taken away some of its freight business, as well as its passengers. The E&LS's single coach was bought from the Copper Range Railroad and Master Mechanic Bob Rose says its quite a chore to keep it in rrepair, but it "rides like a buggy." The E&LS's snowplow came from Henry Ford's railroad at L'Anse. It had been used on four runs to Channing by Jan. 13 this year and it was only out of the roundhouse twice all last winter. On its last run this winter it ground down a deer. Game is plentiful along the E&LS and it's commonplace for a train to bump a deer. Once in a great while a bear or coyote is killed. Trainmen have brought down injured deer and turned them over to the conservation officers. There's a turn at a field near Mashek and trainmen say when the locomotive headlight sweeps it at night there are often "too many deer to count." From 1901 to 1937 the E&LS hauled iron ore from Channing to Escanaba, the Milwaukee Road trains using its trackage, but the creation of an ore pool by the North Western and Milwaukee Road ended this traffic. E&LS traffic is holding up. however, says General Manager Christnsen. Most of the traffic originating on the line is wood products, with a smaller volume of hay and potatoes. From Wells-Escanaba terminal it draws machinery, wood products, petroleum products, coal. It brings in coal, argricultural products, clay, asphalt, salt, logs, pulp chemicals,fertilizer, machinery. The line operates through a forest area but forest products do not compose the bulk of its traffic. Surprisngly, it sends more carloads of pulpwood off its line than it originates and brings in off its line for Escanaba manufacture. The E&LS is all diesel powered now, but it keeps a steam locomotive in its roundhouse at Wells for emergency steam generation. It opeates a train five nights a week between Wells and Channing, skipping Saturday and Monday nights. The line has 75 employes and lots of traditions. Its men like to tell stories about employees like the late conductor Charles Winchester, who was asked by a lumberjack at Wells the fare to Kates. "It's $1.60," said Winchester. "That's too much," said the lumberjack, and he started off down the track to walk to Kates, 53 miles away. Winchester said that on the return trip the train was late and as it pulled ilnto Kates, the lumberjack walked into the station. He had covered the 53 miles in 12 hours. Copemish was settled about 1883 by the Buckley Douglass Lumber Co. as a camp site. 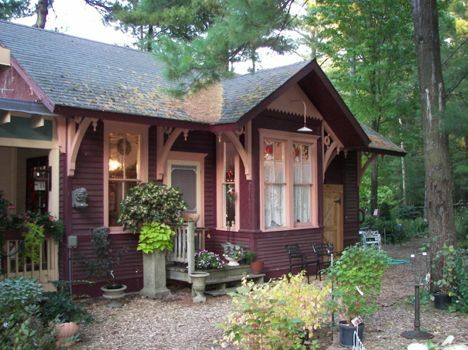 It was a railroad junction point in northeast Manistee County, being served by the Ann Arbor Railroad, the Manistee & North Eastern, and the Arcadia & Betsey River railroads. It became a village in 1891. Comment from Jim Rafferty: In light of the position of the two train order signals in the top photo and the known angle of the crossing of the AA and M&NE railroads, I think it is almost certain that the station was used as a 'Union" station, by both roads. 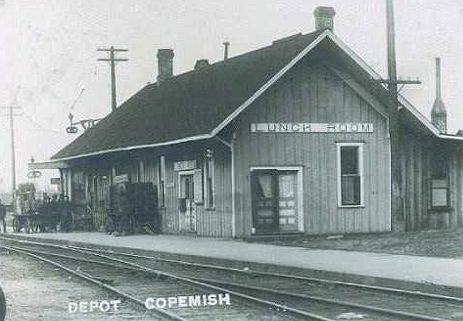 The same article described "riding the railroad line from Cadillac to Copemish on the engine which drew the passenger train was an experience out of the usual order. "The tall, dense timber on either side of the track occasionally changed from evergreen pine to the deciduous hardwood, now leafeless and stturdy in appearance. Everywhere the shadows were heavy, and though no underbrush cumbered the woods the trees stood so close together than eyesight failed to penetrate more than a short distance. "The snow-fall, sheltered by the adjacent timber, marked a straight line upo one side of the track, extending far into the distance and cut off by somber trees marking a turn in the road. Alpena, Oscoda in Fire District, Cheboygan Threatened. Worst Conflagration in history of state aided by wind. Train Crews and Loggers Trapped by Advancing Wall of Fire Across Upper Part of State - Fire Fighting Apparatus Wrecked in Forest, and Trains are Cancelled - Railroad and Wire Communication with Fire-swept Villages is Cut Off - Flames Spread with Great Rapidity on Account of Dry Condition in Upper Michigan. Smoke from the burning villages in the upper part of the state, reaching this city early this morning and everywhere there is a blue haze and smoke smell which has aroused curiosity of local citizens and resorters. The town of Oscoda, with a population of 864, has been completely wiped out by forest fires. Au Sable, across the river and adjoining, with 900 inhabinants, is being swept by flames and it is feared that it cannot be saved. Alpena, population of 6,859, suffers $95,000 loss. Cheboygan, population of 6,849, is threatened, though in no immediate danger. Millersburg and LaRocque, two villages half way between Cheboygan and Alpena, have been destroyed, according to the latest reports. Confirmation of the report cannot be obtained because of burned wires. The 1,800 inhabitents of Oscoda and Au Sable are being taken away from the burned and burning towns on a big steamer, which attracted by the flames, put into the harbor, and on Detroit & Mackinac railway trains made up of freight cars. The special train, bearing fire apparatus and men started ffrom Bay City to the relief of Alpena, was wrecked somewhere in the burning forests north of East Tawas. The fire area is spreading rapidly all over the northern part of the lower peninsula from Au Sable and Alpena on the Lake Huron shore, to Petoskey and Traverse City on Lake Michigan. The crew of a logging train which reached Wolverine over the Haakwood branch of the Michigan Central railway reports considerable difficulty in running through the blazing forests and that an overrhead bridge was burning when they crossed. They fear that another logging train which is still back from Wolberine will not be able to reach safety. The second train has right of way on the line, so no warning can be sent of the burning bridge and there is fear that the crew will run into the wreck of the bridge. Conductor Spenser and a train crew are cut off by a wall of flame and a burned bridge on the Pigeon River branch of the road. The train cannot be brought through until after the fires are out. Between 50 and 60 flat and box cars are reported burned on various logging branches. A crew of woodchoppers on the Richardson branch were forced to leave their tools and flee for their lives before the advancing flames. Many lumber camps are so situated that escape for the men will be difficult. Cadillac reports that Lake City, the largest town in Missaukee county, is threatened. Trains on the G.R.&I. railroads, north of Cadillac, have been cancelled, being unable to force their way through the fires. The entire country is under a pall of smoke. Petoskey reports two cottages a mile from the city burned, and the villages of Ball Siding and Bay Shore in grave danger. G.R.&I. traffic above there was stopped yesterday afternoon at Curfew, a village near Boyne Falls. One man was caught in a burning cottage and nearly suffocated, but was rescued in time and will recover. Two fires in farm timber tracts near Traverse City, did $2,000 damage. A barn of the Traverse City brewery was burned with a loss of $1,000. Booneville, south of Traverse City was threatened by a forest fire, but the city fire department extinguished the flames. While the first report from Trowbridge to the effect that the little village was wiped out was incorrect, two houses were burned and others are in danger. The flames are reported leaping across the track of the G.R.&I. toward Traverse City. Antrim county, of which Bellaire is the judicial seat, is reported swept by flames, as is Oscoda county, of which Mio is the seat. A G.R.&I. train arriving at Boyne Flls, ran through smoe and flames for three miles. Calumet, September 15, 1893. The Mineral Range passenger train due here at 10:00 o'clock this forenoon was held up by four masked robbers at Boston to-day, about five miles south of Calumet, and the American Express Company's messenger robbed of $70,000. Tomorrow is the regular monthly pay day of the Calumet & Hecla Mining Company, they paying their employees usually on that day upwards of $20,000. The currency is obtained from the banks of Calumet, Red Jacket, Houghton and Hancock, and for years the money for the Hancock and Houghton banks has been shipped the day previous to paying the men. This morning there was shipped from the Superior Savings Bank, of Hancock, $30,000 and $10,000 from the National Bank of Houghton. The money was taken from the train leaving Houghton at 9 o'clock and arriving here agt 10. When the train reached Boston station, a lonely spot at the location of the Peninsula mine, which has been idle for nearly a year, a man appeared on the platform and signaled the train to stop. The conductor had already rung the bell for the engineer to stop, as he had passengers for that point. As soon as the man had caused the train to slacken its speed, he stopped inside the little waiting-room and reappeared with a mask over his face. He had also donned a long linen duster. The fellow jumped on the engine and immediately drew his gun on Engineer Shuler, demanding of him to give up the trottle. As he spoke he pulled the trigger and a shot went into the air. Reaching over, the fellow turned the air from the brakes. As this man was climbing the side of the engine, a companion was making the acquaintance of the fireman. As he came up the fireman took the man to be an escaped lunatic, bolted out of the cab and along the running board of the locomotive. He was shot at three times, and finally forced to go back to his post. The engineer was told by the man at his side to turn the throttle over to him and he would run the engine. "You sit quiet and I will run this machine," said he. While this was taking place on the engine, two compansions, similarly dressed, climbed to the platform of the baggage-car, one-half of which is used by the express company. The front end was occupied by the express messenger. The money which consisted partly of gold and silver coin, and partly of paper, was in an iron chest. Messenger Hogan was engaged in making out bills. He hears a crash at the front door, and before he had time to realize what was comming, foud himself looking down the barrels of two seven-shooters. A masked man stood before him. Baggageman Porter was seated in the further end of the car, which is divided by a partition. He was also confronted by a black-masked man and a gun. He did as he bade and kept quiet. Messenger Hogan was ordered by the man holding the revolver to throw up his hands. He did so, and the stranger reached down and pulled the messenger's revolver out of his pocket. He then ordered him to open the iron chest containing the cash, and not delay. The key was produced, the chest opened, the cash removed, placed in a large sack and the robbers withdrew. As they jumped from the baggage car their companions alighted from the locomotive, and the four left for the woods, all in plain view of the passengers, who were now thoroughly excited. As the train increased its speed one of the men turned towards the cars and waved his hand. The robbers forced their way into the car by breaking down the door with a blacksmith's sledge hammer, which had evidently been taken from some of the vacated mine buildings. The four men are described as follows: One large and square shouldered, one tall and slim, one short and thick set, while the fourth is rather below the medium size. The latter was the one who had charge of the engine. Such little time was consumed in the transaction that the train was less than five minutes late when it reached Calumet. Officers were very quickly at work, and within three hours time fully 100 deputy sheriffs were scouring the entire country. The Calumet and Hecla Mining Company promptly offered the officials and express company all the assistance in their power to hunt the rascals down. Fifty men employed by the mining company, who were sworn in as deputy sheriffs, were detailed to go on the search. Houghton, September 15, 1893. The startling intelligence that the train had been held up and robbed was quickly known in this city, Hancock, Calumet and the other mining villages and camps along the Mineral Range and its spurs, and caused the most intense excitement. The sherff quickly organized a posse and started in pursuit, the members of the military companies also started on the trail, and hundreds of miners and other citizens joined them. The miners have not been paid for sevveral weeks, ae many of them moneyless, were expecting to be paid today, and it is pretty certain that if the robbers fall into their hands a rope will be found for them. Not far from the scene of the robbery the sheriff and his party found a revolver and two masks. The trainmen report that the two bandits who held revolvers at the heads of the engineer and fireman wore cloth masks covering a portion of their faces, but the express messenger says the two who forced him with revolvers to put the money into a bag and hand it out to them, wore no masks. The masks found are without doubt those worn by the men at the locomotive. That they should have thrown these away was natural, but that one of them should also throw away his revolved, is looked upon as significant. It is interpreted as a desire to get rid of something that might tend to incriminate the owner of it were found upon his person in these suspicious times, and it is argued that the owner intended to mix with his fellowmen. Had he been determined upon flight, and resistance if pursued, his revolver would have been the last thing to part with. Last Friday evening the express train on the Michigan Central Railroad, bound to Detroit from Chicago, was considerably behind hand when it reached Ann Arbor. The conductor announced at the latter station that no stop would be made between Ann Arbor and Ypsilanti. This was not regarded as unusual, but when, after leaving Ypsilanti, it was announced that no stop would be made before reaching Detroit there was much comment. One passenger remarked to those near him: "I'll just wager a small amount of money that a stop is made before reaching Detroit, because we are to make two railroad crossings." The train showed no sign of stopping at the signal west of the Flint & Pere Marquette Railroad crossing [at Wayne Jct.] and presently whizzed across these tracks at a high rate of speed and kept on for Detroit. The same thing was repeated at the Grand Trunk crossing [West Detroit], except that the train stopped after it had crossed.